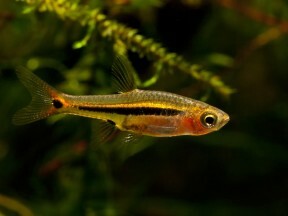 Male specimen from the UK aquarium trade. ...but may prove difficult to swallow unless chopped to a suitable size. ...though the colour can also vary depending on mood and the quality/angle of light. Another specimen with a reddish-orange colour pattern. A large group of the species in nature at an unspecified locality in southern Thailand. 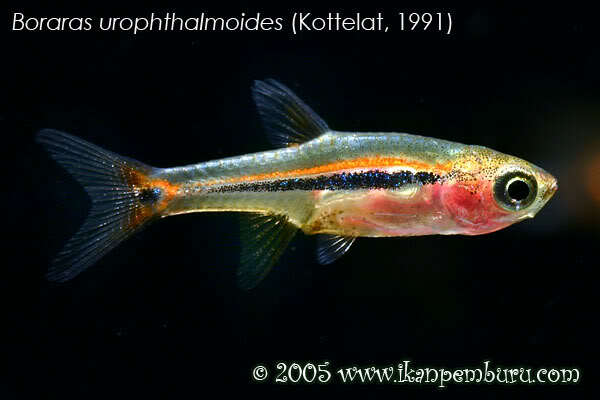 urophthalmoides: from the specific name urophthalma, and Greek εἶδος (eîdos), meaning ‘form, likeness’, because this species was formerly referred to erroneously as Rasbora urophthalma. 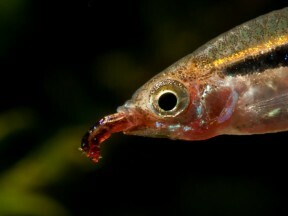 The epithet urophthalma is from the Ancient Greek οὐρά (ourá), meaning ‘tail’, and ὀφθαλμός (ophthalmós), meaning ‘eye’, in allusion to the black spot on the caudal-fin base. Described from a freshwater swamp associated with the Sai Buri River in Pattani province, southern (peninsular) Thailand but currently considered to range throughout much of southern and central parts of the country, with the province of Narathiwat on the border with Peninsular Malaysia appearing to represent the southern limit of its range. The full type locality is ‘Thailand: Pattani Province: swamp near Sai Buri River, 43 km northwest of Naratiwat on road 42, Ban La Han’. Additional records are not extensive but it seemingly occurs throughout the Mae Klong and Chao Phraya river basins and has been recorded in both Vietnam and Cambodia where one notable population inhabits the moats and ponds of the Angkor Wat temple complex near Siem Reap. 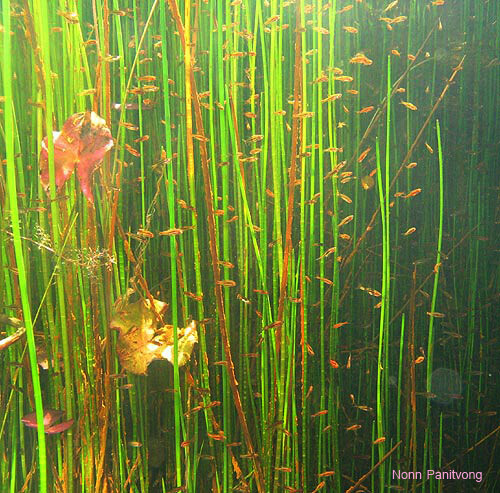 Inhabits shallow bodies of water such as swamps, marshes, floodplains and rice paddies where it’s typically associated with submerged vegetation in predominantly clear water. It’s also known to move into temporarily inundated areas during the wet season. Filtration does not need to be particularly strong as it mostly hails from sluggish waters and may struggle if there is a fast current. 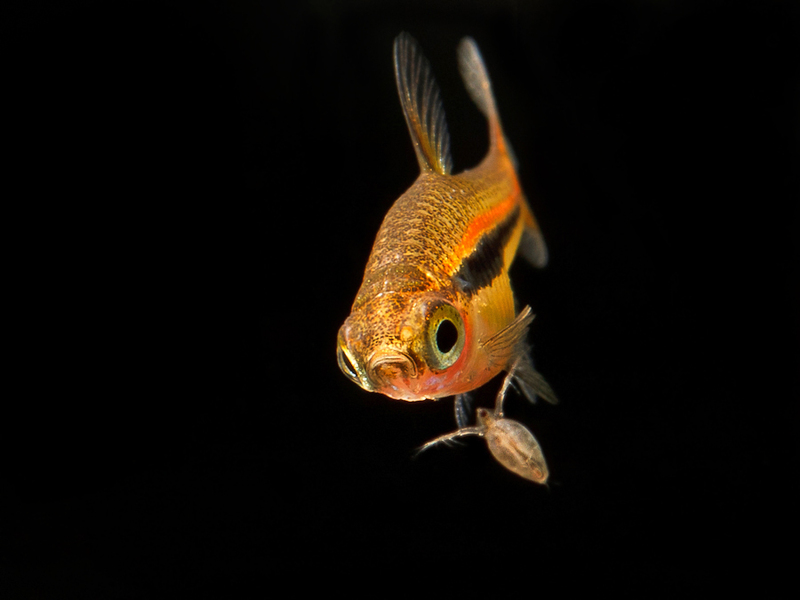 Do not add this fish to a biologically immature tank as it can be susceptible to swings in water chemistry. It also makes an ideal companion for shy anabantoids such as Sphaerichthys, Parosphromenus or the more diminutive Betta species and in a planted set-up can be housed alongside freshwater shrimp of the genera Caridina and Neocaridina. We don’t recommend keeping it with other Boraras as hybridisation might occur. It’s a shoaling species by nature and really should be kept in a group of at least 8-10 specimens. Maintaining it in decent numbers will not only make the fish less nervous but will result in a more effective, natural-looking display. 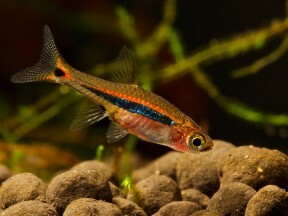 Males will also display their best colours and some interesting behaviour as they compete with one other for female attention. 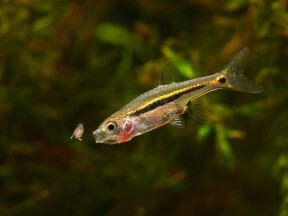 Mature females are noticeably rounder-bellied and often a little larger than the slightly more colourful males. However if you want to increase the yield of fry a slightly more controlled approach is required. The adult group can still be conditioned together but one or more separate, perhaps 10-15 litre, containers should also be set up. The widely available plastic ‘grass’-type matting can also be used and works very well. The water itself should be of pH 5.0-6.5, 1-5°H with a temperature towards the upper end of the range suggested above. A decent-sized clump of Java moss or other fine-leaved plant should also be added filling perhaps half the available space. Filtration is not really necessary but you can use a small, air-powered sponge filter if you prefer. This species appears to vary in colouration depending on collection locality which has led to some confusion with B. brigittae as some populations can develop a strong orange/red stripe above the dark lateral marking when in good condition. 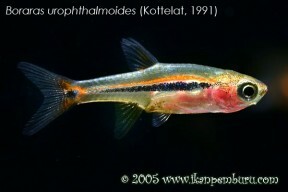 B. urophthalmoides can be easily identified by its smaller adult size, distinct round, dark blotch on the caudal peduncle, comparitively long, unbroken lateral stripe and less uniformly red patterning. Its sometimes seen on sale under the trade names of ‘sparrow rasbora’ or ‘exclamation-point rasbora’, the latter in reference to the distinctive pattern formed by the dark body markings. I have 17 of these for about 7 months now in my aprox. 50 liter tank along with 2 Ottos and numerous shrimps. They are doing very well in planted tank with anubias, microsorum, java fern and many ceratophyllum demersum and lemna minor floating on the surface providing shade. I think that choice of water flow isn’t crucial although very strong flow is not a option. For some time I had medium flow and fishes ocasionally liked to swim in front of it and into the water current no matter where I directed it. Now I have small flow and it seems that they enjoy it the most. I don’t measure my water stats, although I know that my local tap water is very hard and rich with buffers and minerals. I always leave water to stay in open canister for 5-7 days before I make 20-25% water change every 7-10 day. They seem to like it, and I put in half of catappa leaf, 2-3 brown of white oak and half of walnut leaf in aquarium every 2 weeks and let them to rot or the shrimps eat them. I’ve heard that it have benefits on fish health and my water is light yellow as becouse of released tanins. My aquarium was cycling for about 2 months before fishes came and firstly I put 6 of them(that was all of these in shop at the moment)and they were shy, hiding in the anubias that is attached to the mopan wood. When I bought 11 more they shoal and become more brave and relaxed, although they are still sometimes scared when somebody suddenly come near the aquarium. So my advice is that these need to be kept in minimum number of 10. 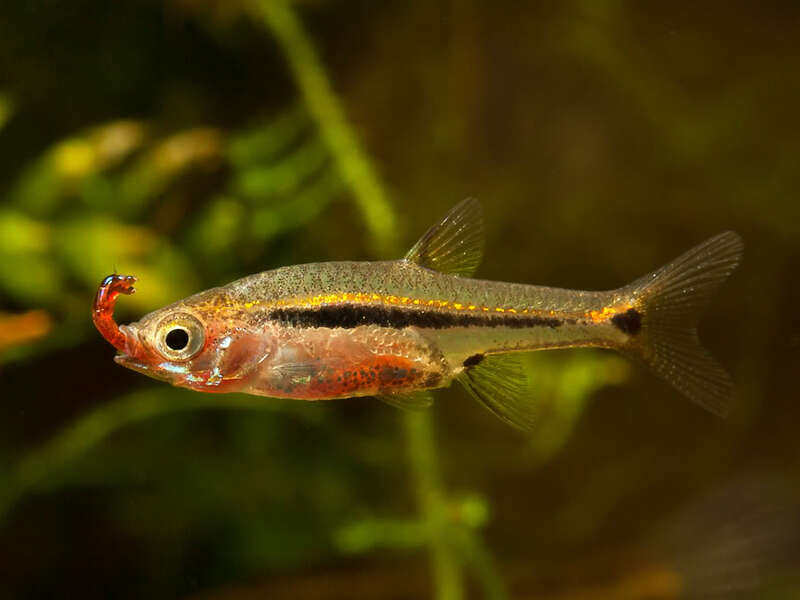 I feed them with flakes that i crush between my fingers to make almost dust of them, with hard crushed spirulina cychlid chips and 2-3 times a week with frozen food(Corethra plumicornis in Corethra crystalinus larvae the eat like crazy and they love Chironomus plumosus larvae too). Larvae need to be cut down to 2 or 3 pieces before boraras could eat them! i have 3-4 dominant males that have fascinant colours and sometimes they make some small territories and chase all other fish that swims through that area. They crush at other males but also females, which I don’t know why becouse I’ve red that they attack other males when they are reday to spawn but not other females. I don’t know were they spawned or not, never seen it, never found any eggs or fry(my shrimps are top cleaners if there were any). 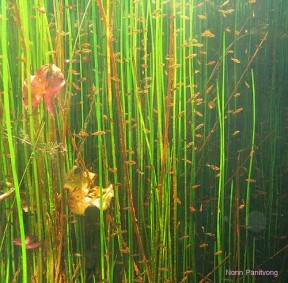 I think that for spawning water really need to be softer and with lower PH. But I’ve seen that ”interesting behaviour” that males sometimes perform in fornt other males and group, I call it ”crazy dance”, it is really funny to watch. To conclude, these fishes are really amusing and funny to watch, they fit in very small nano tanks, they are sociable in their group, sometimes they have little fights over territory but nothing with bad consequences, and they look like some forest dwarfs when they are coming from the plant bushes one by one when they know they will eat. They shoal tightly sometimes(suppose when they are scared or insecure) but most of the time they are not in formation and swim loosely in groups of 3-4 or even every fish by itself. Started out with 11 specimens in a well planted 20 gallon tank. They were initially very active, and shoaled very beautifully moving and exploring the hardscape. 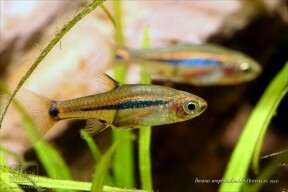 Within a week of keeping them in this tank, there was significant spawning behaviour. This would occur in the early morning after lights were first turned on. Males will temporarily gain vibrant iridescent blue colouration whilst defending small plots in the aquarium next to bushier plants like Blyxa Japonica and Java Moss. They would then display against each other in small mock fights, before pursuing females in groups of two or three. Once a female managed to get away and was left alone with a male, he would quiver and seemingly lure her into the moss or plant they were nearest two before performing a side by side mating twist. Unfortunately, whether due to a change in conditions or a settling in of the species to the tank, this behaviour has now ceased and they are the shyest species of fish in the tank. Always remaining hidden in thick planting at the back of the tank and barely coming out even when being fed. This condition has improved on two occasions. First with the introduction of two B. Maculatus which schooled with the species temporarily seeming to provoke more activity. Second with the introduction of 15 B. Brigittae. 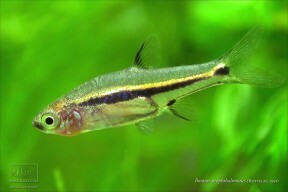 Their similar looking stripe and active nature seems to encourage B. Uropthalmoides to come out more into open water. However this more active behaviour is often contained to mornings/evenings and feeding times. I am soon getting 10 more specimens to join the current group of B.Uropthalmoides in the hopes that this addition will be a tipping point, encouraging much more active behaviour. The only video to be found of them in nature on Youtube shows hundreds schooling together amongst dense reed like vegetation. This may suggest that to achieve a fully active and confident display, significant cover and significant numbers are required.